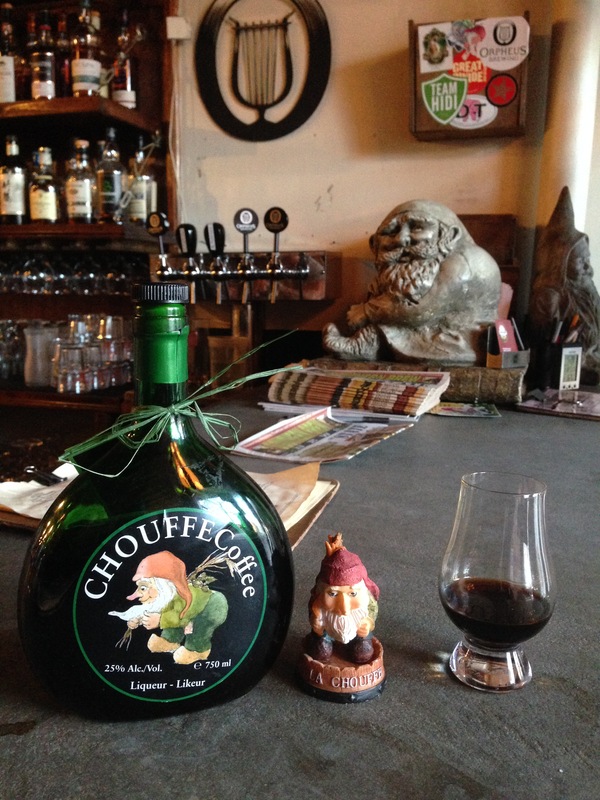 Discovering Gnome Coffee Liqueur…in Atlanta of All Places! As you may or may not be aware, many of us gnomes have relocated to the deep south. Oh you want to stalk us, do you? Well we’re in Atlanta but I’m NOT giving out gate code! I, for one, was a bit concerned about how gnome-friendly it is down here. I mean, these are the people who once owned slaves. How do you think they treat their gnomes?! A little below the belt? Maybe. Okay. Don’t hit me! Moving on. On that note, there was a sunny weekend afternoon recently when I found myself craving something dark and delicious. 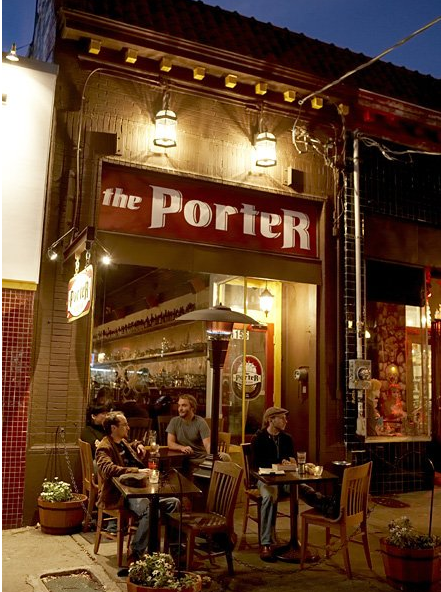 Before I knew it, I was belly up at The Porter Beer Bar in Little 5 Points. Would you believe they have 800 beers here? God that’s stressful. My kinda stress! Chouffe Coffee Liqueur? Was I seeing this right?! I promptly made best friends with the bartender (I mean, who really doesn’t want to have a gnome best friend…it’s kinda like having a gay best friend.) and requested a private groping session with that bottle. My new buddy went the extra mile and poured me a shot. Now that’s what I call service. He even introduced me to the resident Chouffe. Clearly he’s in good company…feast your eyes on those ominous unpainted gnomes lurking in the background! 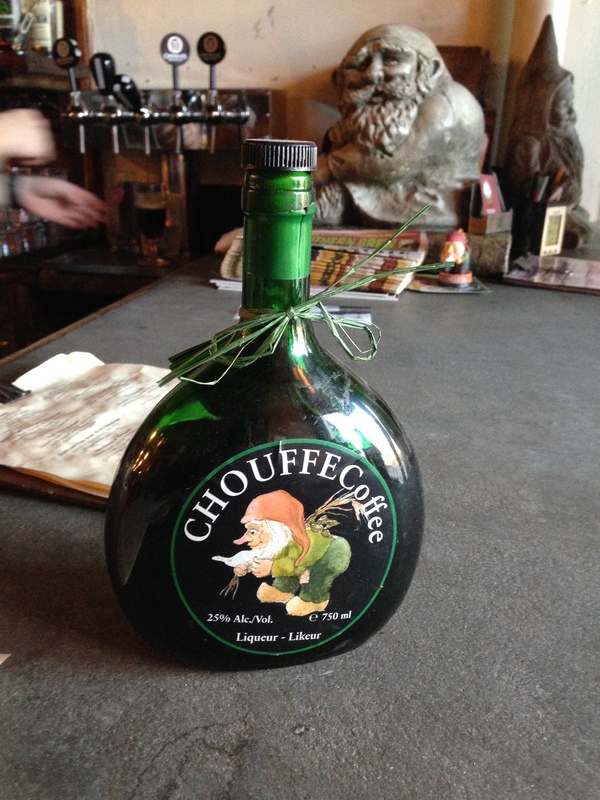 Gnome liqueur was simply delicious…there’s no way around it. Roasty, malty, uber-coffee-y goodness that deserves to be savored to the last drop. I didn’t know these Chouffe gnomes made any kind of non-beer booze, but I haven’t come across any other booze varieties. Have you? Apparently, this is really rare stuff, and the Chouffe brewery doesn’t even advertise it on their website. I’ve been doing some Googling and found a few places that sell it online. However, I’ve never seen it in a store and am highly doubting that I will anytime soon. But then again, I never expected to encounter it in the first place…let alone in Atlanta! Spoiler alert: We gnomes will be visiting the Chouffe brewery THIS MAY! If there is any coffee booze onsite, you’d better bet we’ll find it. Tootaloo drunkies. Hope you’re beginning to recover from your Mardi Gras shennanigans. I was born in a small town in the middle of nowhere that you’ve probably never heard of.It goes by the name of Olney: population 9,108. 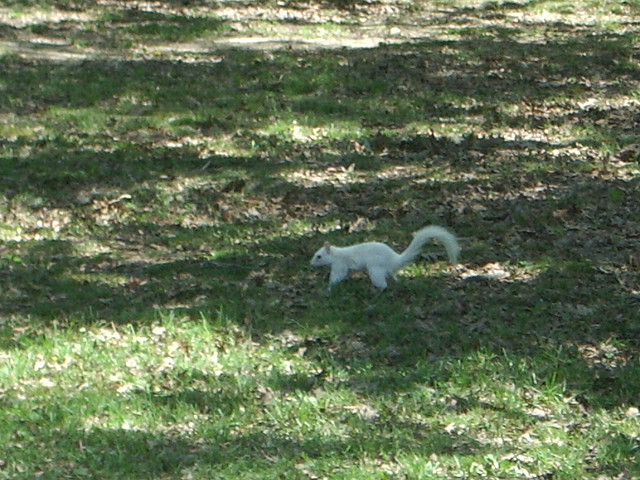 To outsiders, Olney is really only known for one thing: white squirrels. There are a couple different theories about how these albino creatures found their way to southern Illinois, but they’ve emerged as a mascot for this working class town. 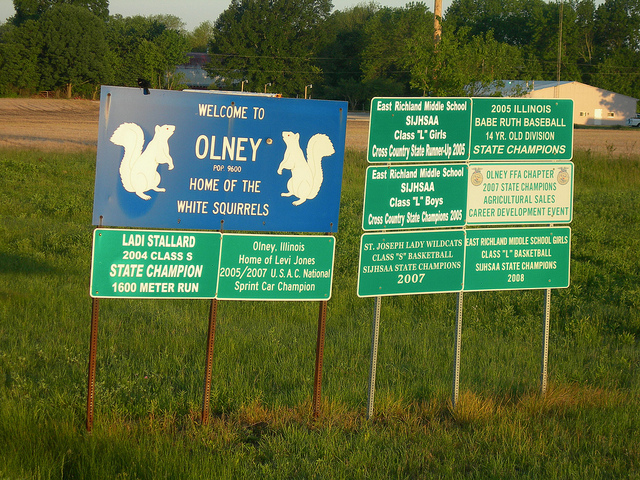 But more recently, Olney has become known for something else…something that I personally take more interest in than any sort of pale-skinned rodent. 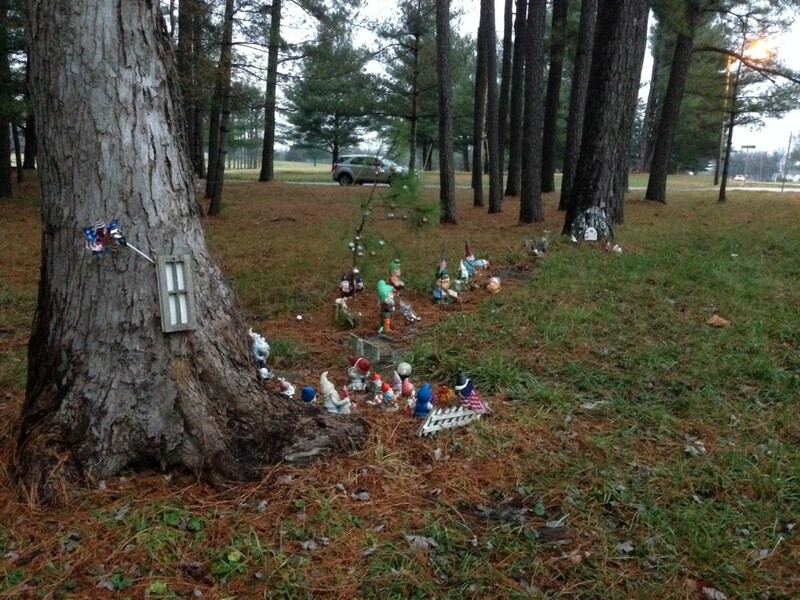 A small community of gnomes has appeared along the west side of Illinois Route 130, just south of the Richland Country Club. After a seven-year hiatus, I finally made it back to my hometown to pay them a visit. You know you’ve arrived when you reach the sign marked “Gnomeville,” but you might just miss it if you blink. 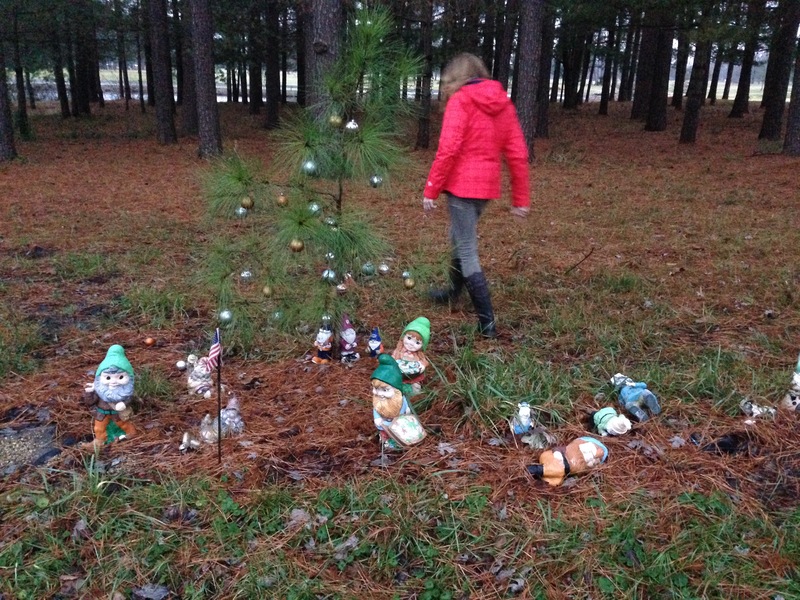 Over the winter holiday season, I convinced my fiancée and my parents to pull to the side of the highway so I could meet these gnomes for myself. I once called this place home and now they do, so clearly we had a lot in common. 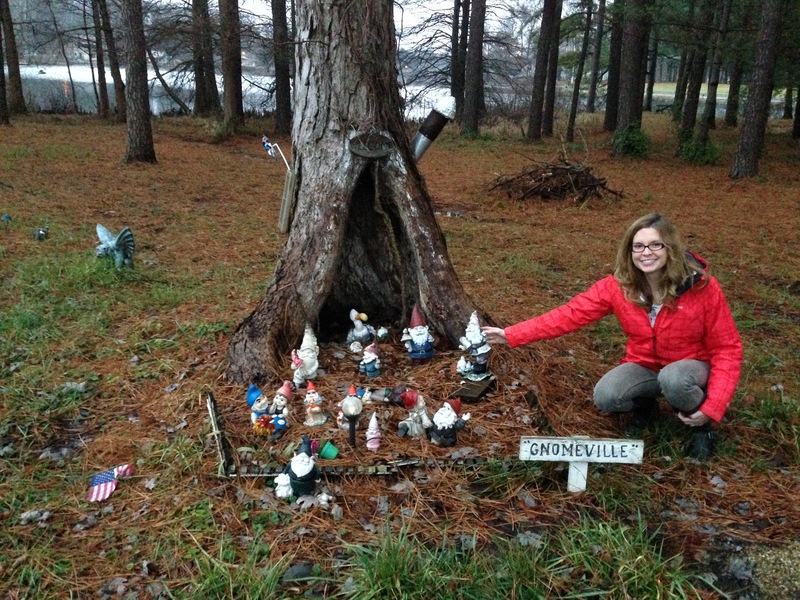 Olney’s Gnomeville has been around for a couple years now, and Cathy Fehrenbacher, who lives across from the highway display, has served as the unofficial caretaker for the gnome village. But unfortunately, the gnomes here are starting to look a bit weathered and are in desperate need of some tender loving care. I’m currently living in Atlanta, but if I only lived closer, I’d surely take them under my wing. Hopefully someone local will lend them a helping hand and keep the quaint and quirky tradition alive. 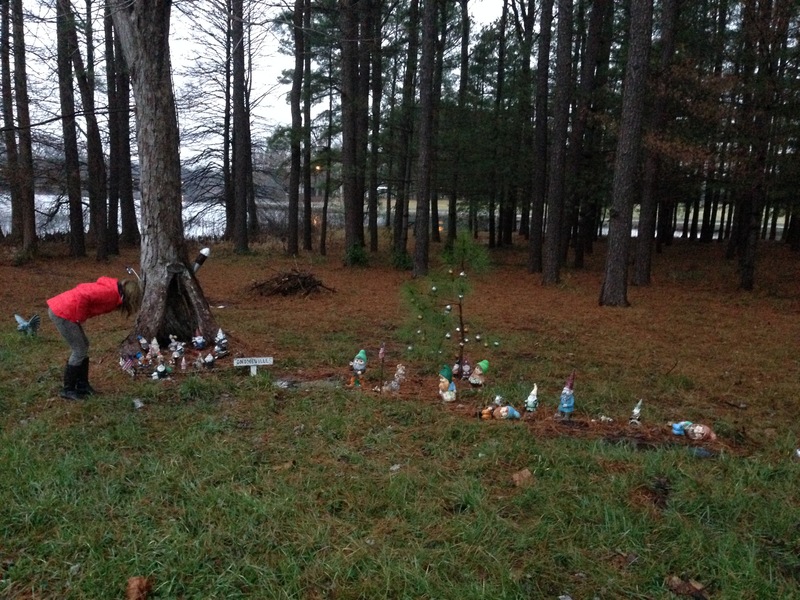 This is a place where gnomes, albino squirrels, and my relatives can all coexist in peaceful harmony. And I look forward to paying them (gnomes, squirrels, and relatives) a visit next time I’m back home. 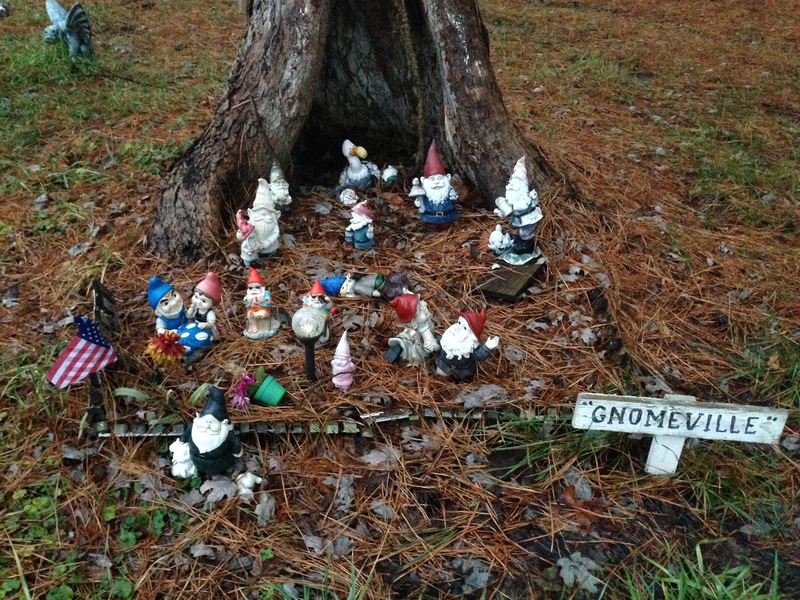 Have you encountered any pop-up gnome communities where you live or have recently traveled? Keep an eye out, because these little guys and gals tend to settle in some of the most unexpected places! *A version of this post is also published on Alyssa v. Nature and scheduled to be included in the spring edition of the International Gnome Club Newsletter!